illus. by Justin Wagner with Warren Wucinich. 168p. Oni. Jul. 2018. pap. $12.99. ISBN 9781620105078. Gr 4–7—After years of being made fun of, Jeremy Duderman finally has an invention that will show everyone he is one of the greatest scientific minds. His Reality Alternative Dimensionator (R.A.D.) 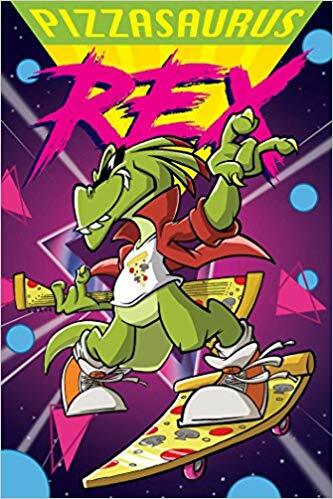 brings Rex Raditude, a guitar-playing, skateboarding dinosaur, to our world. But a dangerous enemy who emerges from the portal that R.A.D. opens up is bent on destroying Rex and all things cool, unless Rex and Jeremy can stop him. Wagner has created a love letter to late 1980s and 1990s cartoons. Cleanly illustrated and brightly colored, this is an entertaining, light story. Each chapter feels like an episode of a TV show; readers can drop in at any moment and understand what's going on, but there's still a larger narrative arc (and big finale). A rapid succession of jokes and setups keep the punchlines coming, either hitting hard or missing the target entirely, with subtle references that adults will pick up on. Wagner relies on stock characters (the bullied nerd, the bumbling henchmen), and some, such as the damsel in distress, feel clichéd at times, but they have their own time to shine during dramatic encounters. VERDICT Fun and funny, this will be a hit among graphic novel fans and parents of a certain generation.